Go to www.woodworkforinventor.com and click “Try it for free”. Fill out a request form in the download trial window to download the trial version. After you have completed the request form to download the trial version, click “Download” and you will receive a software download link to your email address. Click the download link and save the file on your computer. Before you install the files, you must close Autodesk Inventor and MS Office programs. Follow the steps in the installation guide, install the files. After the installation process is complete run the Autodesk Inventor. 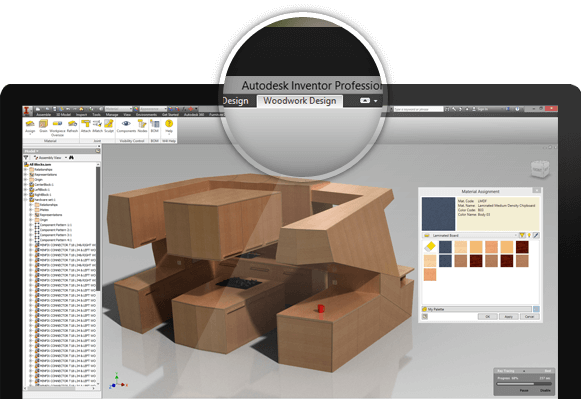 Once you start Autodesk Inventor, you will see a “Woodwork Design” tab on the menu bar. 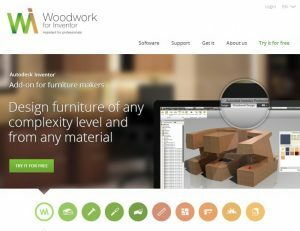 Now you have a Woodwork for Inventor trial version installed on your computer. The trial version allows for a free 45 day evaluation of the complete feature set (except the editing of the material data base). 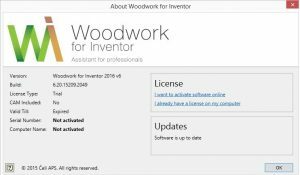 To use a full feature set of Woodwork for Inventor for an unlimited period of time, you must buy a stand-alone license and use it to activate the software trial version thus enabling the use of the software for an unlimited period of time. To ensure smooth activation of the software, your computer must have an internet connection. 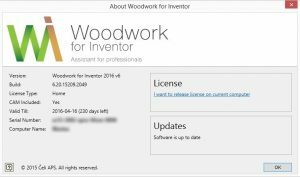 Open Autodesk Inventor and click “I want to activate software online“ in the appearing Woodwork for Inventor software license management table. NOTE: The license management table may also be accessed by clicking the “Help”->“About” button on the “Woodwork Design” menu bar. In the appearing software license activation request window, enter the Serial Number that you have received from your software dealer as well as your email address and click “Submit Request”. The software stand-alone license fill will be generated within 24 hours. You will be notified of its creation to your email address provided in the license activation request window. After you have been notified of the creation of a stand-alone license file via email, restart Autodesk Inventor. In the appearing Woodwork for Inventorsoftware license management table, the license validity status should automatically change to “Permanent” or “Home”. 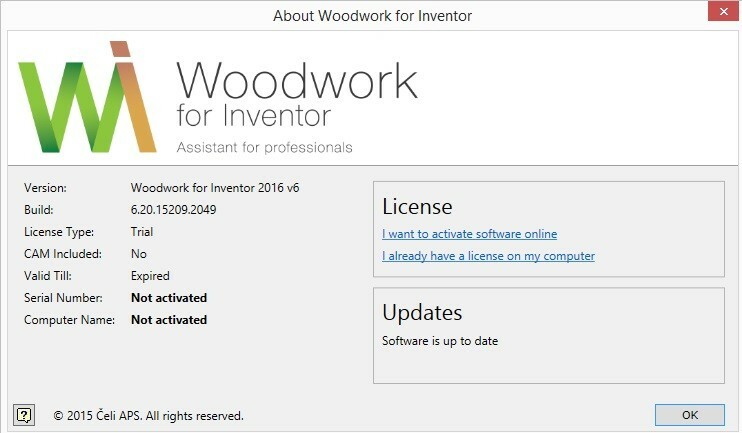 The automatic activation of the Woodwork for Inventor software stand-alone license has been completed successfully. NOTE: If the automatic activation of the stand-alone license has failed, it is possible to manually place this license on your computer. To download this license, click on the link provided in the notification email of newly created stand-alone license. In the manually downloaded stand-alone license file window, click “Download license file”. Save the downloaded stand-alone license file on your computer. 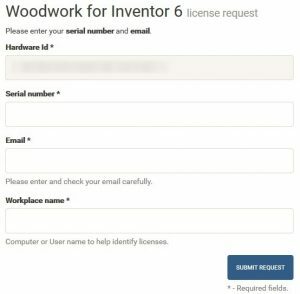 Open Autodesk Inventor and click “I already have a license on my computer” in the appearing Woodwork for Inventor software license management table. NOTE: The license management table may also be accessed by clicking the “Help”->“About” button on the “Woodwork Design”menu bar. In the appearing file search field, specify the location where the stand-alone license file has been saved and click “Open”. The manual activation of the Woodwork for Inventor software stand-alone license has been completed successfully. 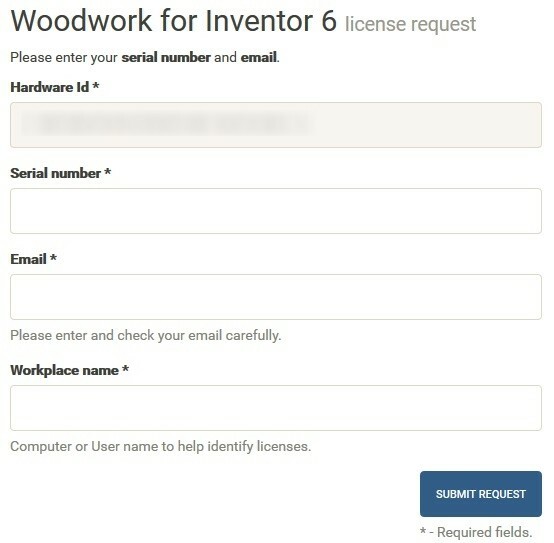 Open Autodesk Inventor and click “I want to release license on current computer“ in the appearing Woodwork for Inventor software license management table. Click “Yes“ in the appearing Woodwork for Inventor software license deactivation request management table. Click “OK“ in the appearing Woodwork for Inventor software license deactivation confirmation management table. You will be additionally notified of license deactivation to your email address provided in the license activation request window. In the appearing Woodwork for Inventorsoftware license management table, the license serial number status should automatically change to “Not activated”. 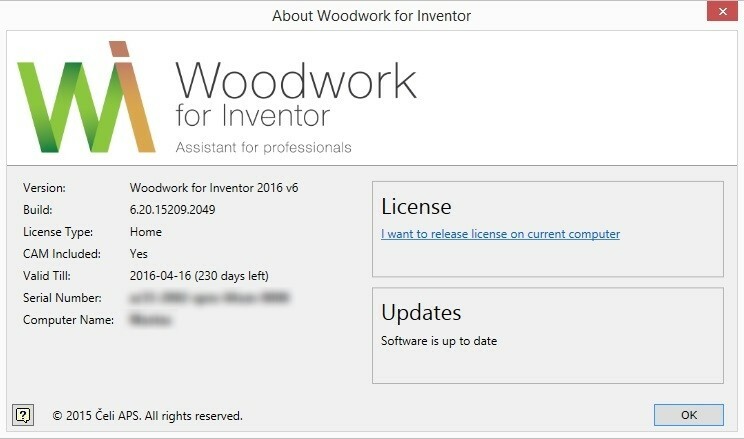 Now you can activate Woodwork for Inventor software license on other computer by using the same Serial number.